David S. Moore is a professor of psychology at Pitzer College and at Claremont Graduate University. He received his doctorate in developmental psychology from Harvard University and did his postdoctoral work at the City University of New York. Dean for Academic Affairs and Professor of Statistics at Purdue University, USA. His entire professional career has been spent at Purdue, with sabbaticals at Princeton, the Commonwealth Scientific and Industrial Research Organization (CSIRO) in Melbourne, Australia, the University of Berne, Switzerland, the National Institute of Standards and Technology (NIST) in Boulder, Colorado, USA, and the National University of Ireland in Galway. He is an elected fellow of the American Statistical Association and was 1998 chair of its section on Statistical Consulting. He has served on the editorial boards of several statistics journals. He has consulted with many major corporations and has testified as an expert witness on the use of statistics in several legal cases. BRUCE CRAIG Director of the Statistical Consultingnbsp;Service at Purdue University, USA (following George McCabe). 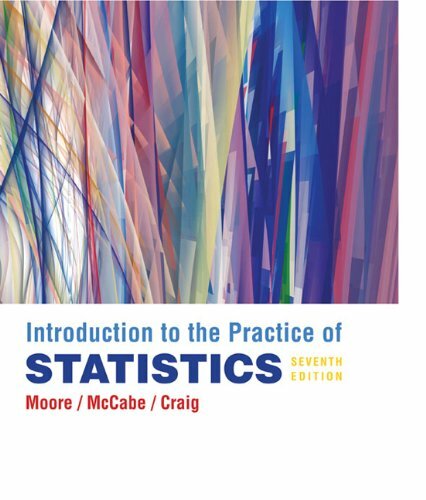 This along with his strong academic research credentials and his many years of teaching statistics at all levels provide the academic experience and contemporary real data from the center's consulting that lecturers have grown to expect in this textbook.